Welcome to the ultimate guide to astrophotography for beginners! In this article, we will cover all you need to know to understand astrophotography, including what different types of astrophotography there are, what equipment you need, and how to learn to take stunning pictures of the night sky, planets, and more. Chapter 1: What is astrophotography and what different types are there? 3. What equipment is best for what type of astrophotography? Astrophotography is the art of capturing images of the night sky and objects in space, like stars, planets and galaxies. The word ‘astrophotography’ is a combination of the words “astronomy” and “photography”, so it is essentially “astronomy photography”. A brilliant example of an astrophotography image capturing the Milky Way above the Earth by photographer Talman Madsen. There are variations in both the different types of astrophotography – as in what is attempting to be photographed – and the techniques in how you are going about capturing the images, heavily determined by what equipment is being used. These variations are covered below. What different types of astrophotography are there? We’ll go through each of these in more detail now. Landscape astrophotography is the combination of traditional landscape photography and astrophotography. It is the practice of taking photos that feature the stars and the night sky whilst including some features of the landscape of the Earth. A great example of landscape astrophotography by photographer Ivan Slade. Landscape astrophotography can produce stunning images that can be appreciated by just about anyone and are growing in popularity due to the growth in image sharing platforms like Instagram. In addition, the increasing popularity of photography as a hobby, and improvements in technology making equipment cheaper and accessible to more people contribute to this. There are few people that cannot be blown away by an image of the Milky Way over a lake or mountain. Landscape astrophotography is the most popular type of astrophotography because it can be done with relatively little equipment – just a good camera, lens and tripod – that can be used for regular photography, is really all you need to get going. More on this later in this article. 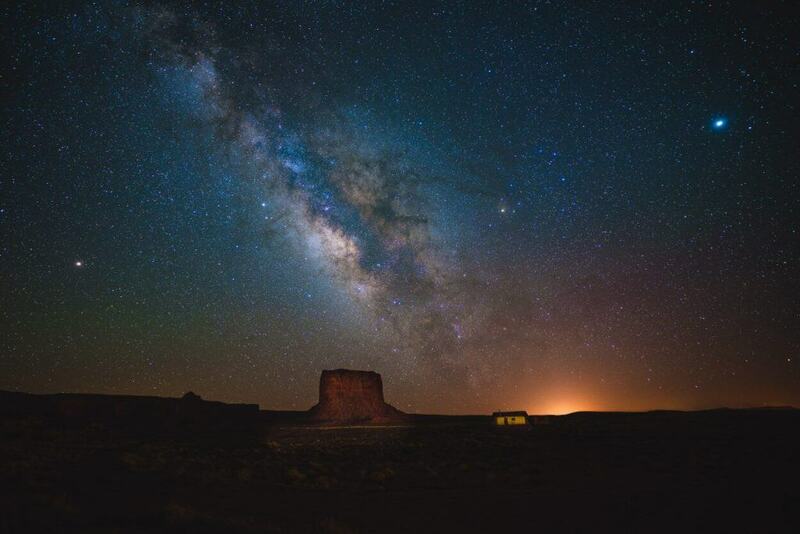 Landscape astrophotography can even be done with a good smartphone camera, but most commonly (and most effectively) it will be done with a good DSLR or mirrorless camera fitted with a wide-angle lens. Frequently, landscape astrophotography will involve capturing our galaxy, the Milky Way, above the Earth. The process of capturing the Milky Way adds a fair bit of work and planning as opposed to just capturing a regular starry sky on a clear night but the results can be astounding and extremely rewarding when it pays off. Image combining landscape photography with astronomy imaging by Abdul Dremali. The image above is a good example of landscape astrophotography. The photographer has captured the Milky Way in a remote location (see here for how this picture was taken). Marcus Cote’s ‘Milky Way Selfie’. A variation on this is to include people in the image – see for example the ‘Milky Way selfie’ photo above by photographer Marcus Cote. Other variations can include the photographer’s own lighting or other objects (see more good examples of this by Laura Krause). Another popular thing to shoot that falls within the category of landscape astrophotography are star trails. Star trails image by Michael Ver Sprill. The star trail effect is created by a long exposure photograph staying focused on one point for an extended period whilst the Earth goes about its natural rotation. In addition, capturing shooting stars and meteor storms can be a variant of landscape astrophotography, provided the image include some aspect of the Earth’s landscape. You may also see landscape astrophotography referred to as “widefield astrophotography”. Widefield astrophotography refers to taking a picture of a large (i.e. wide) section of the sky at one time. Both landscape astrophotography and deep sky astrophotography (covered in number 4 below) can fall into the category of widefield astrophotography since they both typically involve capturing large objects like galaxies in the image. Photographing the Moon and the Sun is known, respectively, as lunar astrophotography and solar astrophotography. The most common way of doing this is with a DSLR or mirrorless camera and a telephoto lens that allows you to zoom in to capture the details of these bodies. It can also be done with a telescope – with the telescope essentially taking the place of the zoom lens. An example of lunar astrophotography by Sebastian Voortman. The moon makes a great and relatively easy object to shoot for astrophotography beginners since anyone can see and locate it and because it is so close (relatively) to the Earth. The moon goes through different phases throughout the month which offer different opportunities and occasionally there will be phenomena like the ‘blood moon’ (a total lunar eclipse). Solar photography is similar in such that the sun is no problem for anyone to locate in the sky, but requires strong filters because of the extreme brightness of the sun. Remember to never look directly at the sun through a camera, telescope or other such equipment. Solar astrophotography by Jakob Halskov. To photograph the sun you need solar viewing glasses so that you can look at it to aim your camera at the bright sun and specialist solar filters to be fitted on the lens. The third kind of astrophotography is planetary astrophotography. This is the practice of photographing the planets and other major objects in our solar system. It is similar in many ways to lunar and solar photography, but what you are shooting will not be obviously visible to the naked eye and so is a whole different challenge. This includes the seven other planets of the solar system (not including Earth) and other objects like dwarf planets (for example, Pluto), or the moons of other planets. Planetary astrophotography is most commonly done with a camera attached to a telescope. This is because you need the focal power of the telescope to pick out and focus on specific objects in space. Planetary astrophotography requires a greater degree of astronomical knowledge, as you need to know what will be in the sky above you when you want to shoot and how to locate it. This is opposed to landscape astrophotography where there will always be stars when there is a clear sky, or lunar and solar photography where anyone can locate the sun or moon in the sky. It is not, however, as challenging as the final type in our list – deep sky astrophotography. The fourth type of astrophotography is deep sky astrophotography. Image of a galaxy called M81 by Ken Crawford. This is the practice of capturing images of “deep sky objects”. The definition of a deep sky object is any astronomical object that is not an individual star or an object with our own Solar System (source). Generally, these are galaxies, nebulae (huge clouds of dust or gas), and other far off phenomena. In general, deep sky astrophotography refers to the process of identifying a specific galaxy or other deep sky astronomy object and photographing it. There are ways that astrophotographers can team up and use the equipment of others to get imaging data. See our interview with Deep Sky West for an example of how remote astrophotography observatories work. Beyond amateur astrophotography, much deep sky astronomy imaging comes from NASA and other space agencies that send telescopes into space. The most famous example of this is the Hubble Space Telescope, which has sent back countless stunning images. Image of the Sombrero galaxy, Messier 104 (M104), taken with Hubble data. Credit NASA and The Hubble Heritage Team (STScI/AURA). There are of course crossovers between these four types of astrophotography. For instance, if you capture the moon or one or more of the planets brightly in a landscape astrophotography image, then you have also engaged in planetary astrophotography but the categorization is useful and you will find it used commonly. Now, once you know what you want to shoot, we can move on to deciding what equipment you need. As well as variations in what you are trying to shoot, the equipment that you have will also heavily influence the type of astrophotography that you will be able to do. You can broadly categorize two ways of going about astrophotography – without a telescope and with a telescope. 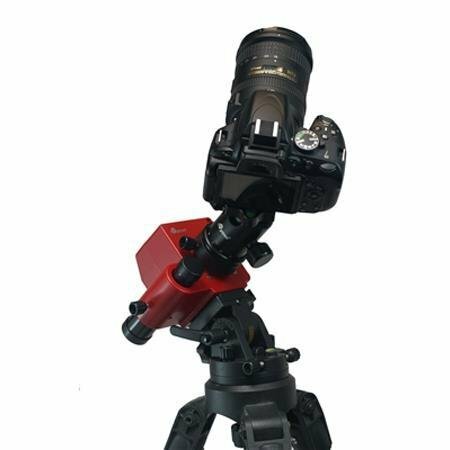 This is the essential kit for landscape astrophotography and for capturing beautiful images of stars in the sky. We will cover what you need more detail now.. The easiest way to get going in astrophotography is to use a good, regular camera. By “regular” we mean that it could be used for any other type of photography, and by “good” we mean that it has to be capable of having the camera settings changed manually. Most commonly, this will mean using a DSLR camera, or a mirrorless camera. It doesn’t have to be the best camera on the market, especially when you are first starting out. I would recommend any beginner to first get an entry-level DLSR or similar and learn to push it to its limits. If you already have a camera like this but are unsure if it is good enough for astrophotography, give it a try first. You’ll learn the limits of your camera and be better able to take advantage of any improvements when you upgrade in the future. This doesn’t have to be expensive (although I realize that this is a relative term), but will probably be at least a few hundred dollars (US) for a new model. Good examples of entry-level DSLRs in 2019 are the Nikon D5600, the Canon EOS REBEL T7i and the Pentax K-70. 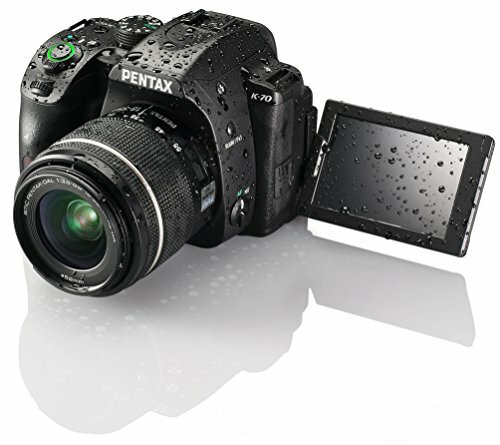 The Pentax K-70 is a good example of an entry-level DSLR camera in 2019. DSLR stands for digital single lens reflex camera and these are the most popular type. A mirrorless camera differs from a DSLR in its internal design and components (most notably it doesn’t have a mirror inside, hence the name) and that is all you really need to know for our purposes. What is important though is that it is a mirrorless ‘interchangeable lens camera’ (sometimes abbreviated to MILC) as some mirrorless cameras are just compact cameras that don’t allow you to attach different lenses, which won’t work for our purposes here. that you can have full control over key settings like shutter speed, aperture, focus and ISO (using these settings for astrophotography is covered below in chapter 4). For more detail on what camera you need and some recommended models in 2019, see our article on the best cameras for astrophotography. The next most important piece of astrophotography equipment is the lens that you attach to the camera. Lenses that are a fixed focal length (for example, 24mm) are known as prime lenses. Lenses that are a variable focal length (for example, 18-55mm) are known as zoom lenses. In general, prime lenses are better quality than zoom lenses of similar cost, but lack the flexibility of being able to shoot at different focal lengths. Most entry-level DSLR cameras come with a standard lens. 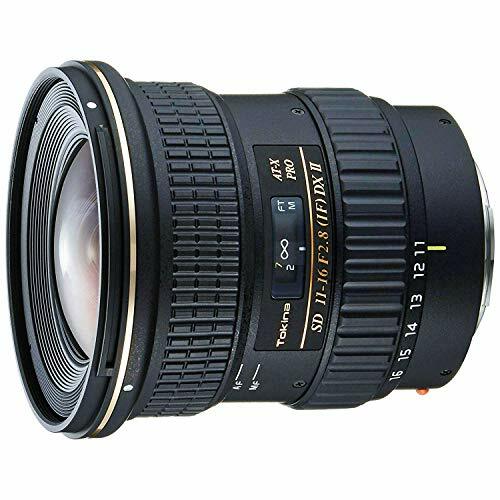 This is referred to as a “kit lens” and is usually a zoom lens of 18-55mm. 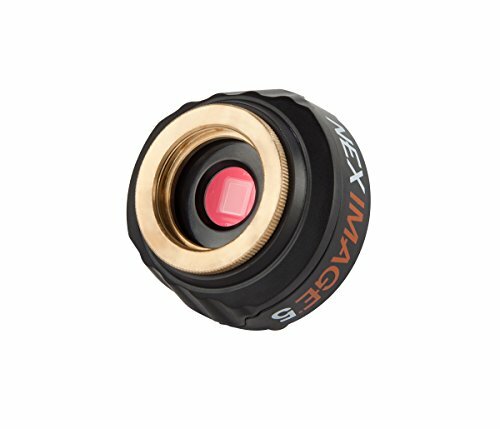 Whilst you can certainly use this lens for astrophotography (and it is definitely worth trying before you buy anything else), it is not perfect for our purposes of shooting amazing pictures of the stars and planets. Wide-angle lenses have short focal lengths and capture wider expanses of the sky (or whatever you are shooting). A lens’s focal length is specified in millimeters – with the lower the number the wider it is and the more sky you can capture. It’s not important for our purposes here to delve any more deeply into the differences this makes, but what does matter is knowing what you have before you buy a lens for astrophotography. The Tokina 11-16mm is an example of a good wide-angle lens. In addition, the lens you use should be “fast”. A fast lens has a large aperture and can collect more light. The speed of the lens is indicated by an f/number. Slightly confusingly, the lower the number, the larger the aperture of the lens. A good lens for astrophotography will have an f/number rating of f/2.8 or lower. See here for recommendations on the best wide angle astrophotography lenses. Telephoto lenses enable you to focus in more narrowly on far away objects. You may have seen them used for wildlife or sporting photography when the photographer is a long way from the subject they are shooting. If you are attempting to take great pictures of the moon or the planets in our solar system then it makes sense that you have a lens that offers as much zoom as possible. You will probably need a lens with at least an 85mm focal length for good results. 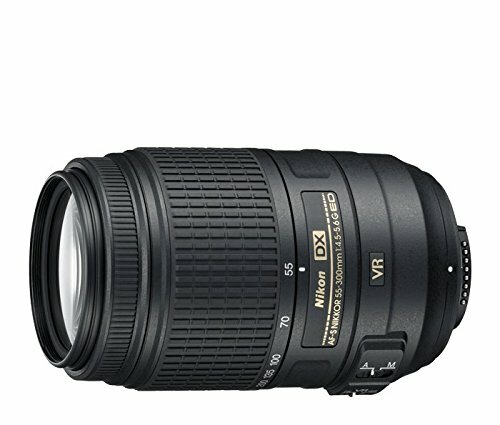 This Nikon 55-300mm lens is a good example of a telesphoto lens. Having a good, sturdy tripod is vitally important for astrophotography. When taking astronomy images you will be taking long-exposures which means that your camera will need to stay perfectly still or the image will suffer from distortion. Even the tiniest camera shake can ruin your images. Carbon fiber tripods are widely considered the best as they are lighter to carry than aluminum alternatives but don’t lose any sturdiness. They do tend to be a little more expensive though. 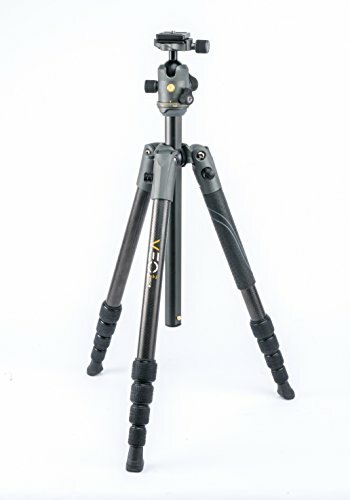 A Carbon Fiber tripod from manufacturer Vanguard. See here for our recommendations on the best tripods for astrophotography in 2019. When you photograph an astronomy object you are (obviously) pointing your camera at it from your position on Earth and shooting. Because you are aiming into a dark sky, what you are doing is trying to gather as much light as possible in order to get the best image. Therefore, the longer the exposure, the better the resulting picture because more light has been gathered. However, because the Earth is constantly rotating it means that what you are photographing is effectively moving while you shoot it (in fact, both you and the object are moving). This means that if your exposure time is too long you will get distortion on the image. This could be a blurring on a planetary image or trails when photographing stars. We’ll cover settings and how to best take astronomy images below, but there are ways to work out exactly how long you can have your exposure time based on the camera and lens that you are using. It can range from 5 seconds up to a minute. Tracking mounts provide a solution to this. They fit between your camera and your tripod and slowly adjust where your camera is pointing according to the rotation of the Earth. This allows you to stay focused on the object you are photographing longer, and therefore produce better, sharper images. When combined with a tracking mount, deep sky astrophotography is also possible with a telephoto lens. 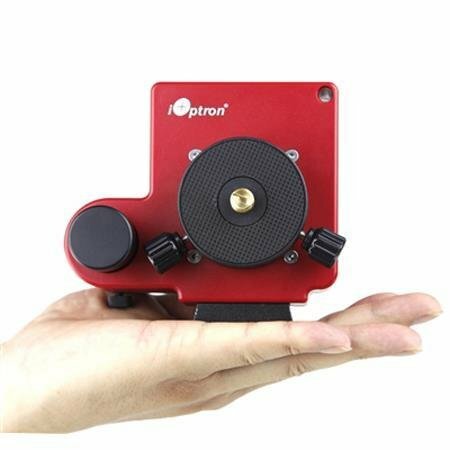 An example of a popular astrophotography tracking mount is the iOptron SkyTracker Pro. (See some case studies of it used by expert astrophotographers here and here). Well-regarded alternatives are the Skywatcher Star Adventurer and the Vixen Polarie. 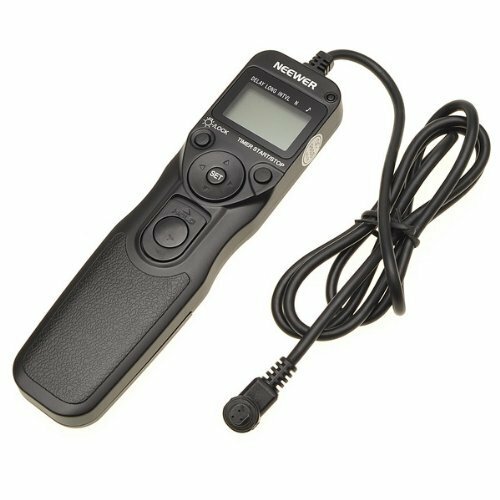 A remote shutter release is a wireless device that you use to operate the shooting function on your camera. A basic remote shutter release. This enables you to take photos without actually touching the camera and is essential since even the tiniest movement will result in distortion of your images. A bare-bones shutter release will cost you just a few dollars – see here on Amazon. Just make sure you check to get one that works for your camera make and model. An alternative is to use the shutter release delay setting on your camera – so the picture is taken a few seconds after you press the button. This works fine but I find it can test the patience a little, especially if out on a cold night! A more advanced alternative to the remote shutter release is an intervalometer. An intervalometer is a programmable remote shutter that you can use to set exposure time, interval between photos, total number of photos to be taken, and the time delay of the first picture. This extra functionality can be priceless as you may want to take multiple pictures of the same object in succession. The purpose of this is to then “stack” the images in post-production after (more on this later). This is a good practice that can bypass the need for a tracking mount, although both methods have their merits. An example of an intervalometer can be found here on Amazon. Just make sure to buy one that is compatible with your camera make and model. A final useful bit of kit for when you are out photographing the sky at night time is a headlamp. Using one of these enables you to have your hands free to operate your camera and set up your equipment in the dark. Nothing fancy is needed and they can be picked up for relatively cheap – see here. The other way to go about astrophotography is to do it with a telescope. Some of the equipment will be the same as the above, but you will essentially be swapping out the camera lens and replacing it with the telescope – the telescope effectively is the lens. Everything covered above in astrophotography without a telescope is relevant here as you should be able to attach your DSLR or Mirrorless camera to your telescope in place of a lens. To attach a DSLR or similar camera to a telescope you need a couple of things called a T-ring and a T-adapter. This is called the T-mount system (the “T” stands for equipment manufacturer Tamron that devised the system in the 1950’s). The T-Ring is the object which fits into your camera where the lens would normally go. T-Rings are made and sold to fit specific camera bodies. 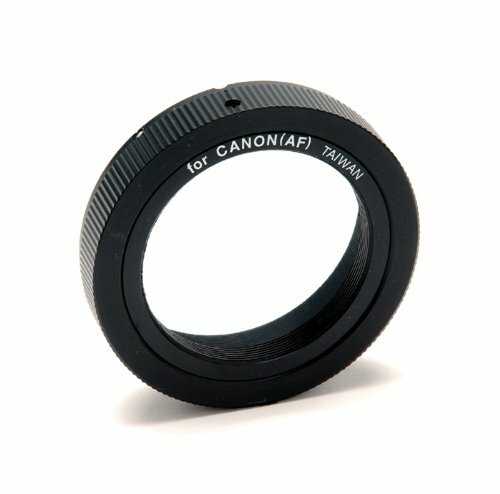 A T-Ring for Canon cameras. 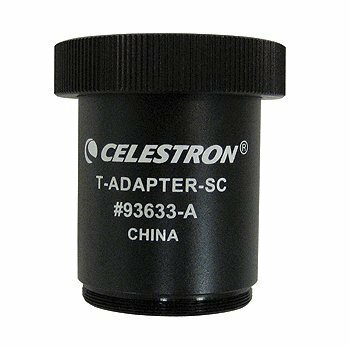 The T-Adapter is the object that will connect your telescope or lens to your camera. Each T-Adapter is uniquely designed to fit different telescopes. A T-Adapter from Celestron to attach DSLR camera to a Schmidt-Cassegrain telescope. These pieces of equipment will be different depending on your camera and telescope types so be sure to get the right ones for you. How the camera and telescope fit together with the T-RIng and T-Adapter. CCD stands for Charge-Coupled Device. These are specialist astrophotography cameras. If you’ve never seen one before you’ll notice that there are no buttons or controls of any kind, no screen or viewfinder. They are merely small metal boxes which can be a little hard to get your head around. A CCD camera by manufacturer Orion. A CCD camera cannot be autonomously controlled like a regular camera but has to be connected to a computer and operated via software, like a webcam for example. 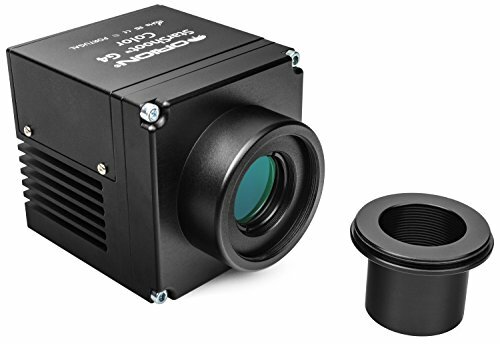 CCD cameras can capture exposures that can last from minutes to hours and because of this they are well suited for deep sky astrophotography – where you need to gather a lot of light to get an image of an extremely far off object. Once the exposure has finished, the data is sent to the computer for digitization and post-production. For case studies of CCD astrophotography see Leonardo Orazi and Ken Crawford describe in step-by-step details what equipment they use and how they capture images. Whilst they have some advantages, I wouldn’t recommend a CCD camera for a beginner. In my option it’s best to use a regular DSLR or similar camera – it’s cheaper and can be used for all other photography once you take it off the telescope. You may also see CMOS (Complementary Metal-Oxide-Semiconductor) cameras mentioned. These are similar to CCD cameras (at least for a beginner) and the naming refers to the difference in the sensor used. CMOS cameras have traditionally been cheaper and less powerful alternatives to CCDs. In recent years though, the performance of CMOS cameras has caught up so are likely to become more common in the future. Once you have your camera you’ll need a telescope. 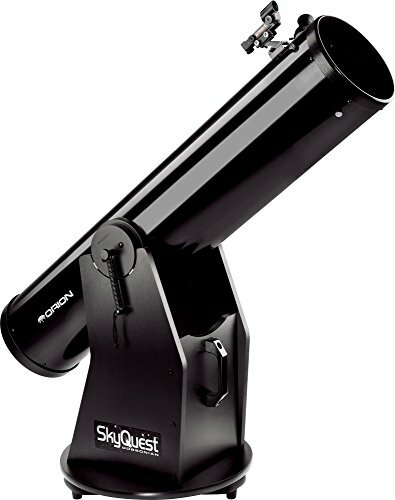 The Orion SkyQuest is an example of a reflector telescope. The range of different types of telescope can be quite confusing to a beginner and hard to work out what is best for you. All can be used for astrophotography. For more information on the best telescopes available in 2019, see our article here that includes descriptions of what the different specifications mean. A mount is an instrument that fits between your tripod and telescope and very slowly moves where your telescope (or camera) are pointing to compensate for the Earth’s rotation, just like the tracking mount for a camera covered above. As touched on before, our planet is constantly moving and rotating and to take photos of astronomy objects in the sky you need to focus on them for extended periods of time. This can be anything from a few seconds to minutes, or even weeks and months for more advanced deep sky photography. A mount allows you to focus on an object and then track it to allow you to focus on it and photograph for longer period. Mounts come in two basic types – Alt-Azimuth and Equatorial. Alt-Azimuth mounts are the most common and basic mount, but Equatorial mounts are more precise and better suited to astrophotography. You’ll want also a motorized mount so that you don’t have to adjust manually, which is both harder to do and will cause vibrations which will impact your images. 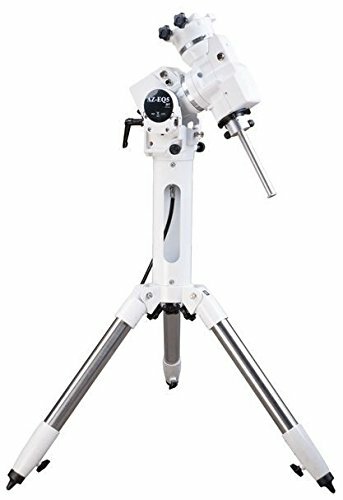 The Orion AstroView is a motorized equatorial mount. A third, more sophisticated option are Goto mounts. These are computerized and can find and track objects from a database. You just need to tell it where you are, the date and time, and what you want to focus on. This makes it easier but some say that it takes away the challenge of finding objects in the sky which can be a great way to learn. I’ll leave it to you to decide what is best for you, but for me, Goto is quicker, saves time and can work best in poor sky conditions where the system will find the object that would be much harder for you to spot manually. However, they are generally more expensive. 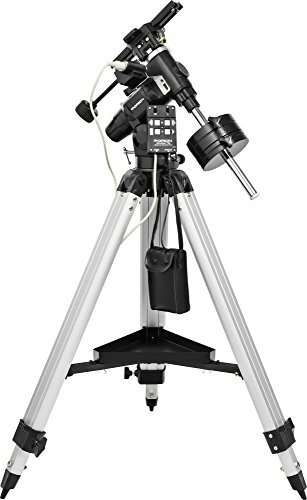 Again, a sturdy tripod is essential but it will be your telescope that is making up the bulk of the weight to be carried and so it needs to strong enough to be able to take this heavier equipment. When you buy a telescope it will likely come with a suitable tripod. As covered above, you’ll also need a T-Ring and T-Adapter for attaching the camera to the telescope. 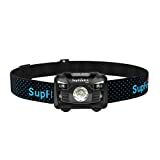 You’ll also probably want a headlamp, fingerless gloves (so you can still press the buttons on your camera) and things like a good bag for your equipment. In addition, a portable power supply can be useful so that extended outdoor sessions are not ruined by running out of juice. Astrophotography is also possible with your smartphone. What you can do and the results you can expect will be limited compared to the methods outlined above, but it can be done and smartphone camera performance gets better every year. See here for our guide to smartphone astrophotography. This chapter is about planning your astrophotography images by taking advantage of the best tools and guidance available. Even if you’ve got the greatest equipment in the world, you’ll struggle to get great shots unless you find the right places to shoot from. A key thing for this is light pollution. For astrophotography, you need dark skies. If you live in or around a city or reasonable size town your images will be affected by the glare generated upwards from artificial lighting from streets and buildings. You can use websites like Blue Marble to find better spots to shoot your astro images with less light pollution. To achieve great astro images you will also need clear skies – i.e. no clouds. Simple weather forecast sites and apps should help with this but there are also some with photographers in mind, including Dark Sky. Another thing to have to factor in is the phase of the moon. The moon goes through a monthly cycle and you will want no moon in the sky when you shoot as it is a source of light pollution. PhotoPills includes a moon phase calendar but there are also some good free sites too, like Time & Date. In the Northern hemisphere, the Milky Way core is visible from April to July, with June being the peak time. In the Southern hemisphere, it will be available to shoot from February to October, with July being the peak time. Stellarium is a great planetarium website that allows you to work out when the Milky Way, planets and more will be visible from your location. Another option is In-The-Sky.org. For more tools and some alternatives to those included here, see the best apps for astrophotography. What settings you use to achieve astronomy images will obviously depend on what it is you are shooting and what equipment you are using but there are some general good practices to follow. ISO is a changeable setting on a camera that is adjusted according to the light available when you are shooting. When you put it higher, you are able to shoot better in low light. For regular photography, you would use a low ISO for daytime or other well-lit photography, and higher ISO for nighttime or when the lighting is not as good. You might think then that you would want a high ISO for astrophotography? However, this is not necessarily right. The downside of using a high ISO is that it degrades the image quality. Pictures taken with high ISO tend to have what is called “noise” on the image – a kind of graininess. Noise can be hard to identify to a beginner but with experience you will learn to see it very clearly. With astrophotography, you will have to learn through trial and error what works for you and your camera, but generally you will be taking long exposures and putting the ISO as low as you can (this may still be quite high though). You may also stack the images (see below for details on this), or you may be using some kind of tracking mount to enable you to take even longer exposures, and so these mean you can keep the ISO low. Generally, you want to aim for as low ISO as possible to get the best quality images but you will need to practice and learn the limits and capabilities of your camera and equipment. Aperture refers to how wide open the part of the lens is that collects the light for the image. As covered in our overview of lens earlier in this article, you will want to be using a lens capable of a fast aperture. You will then want to set it to be at the lowest (most wide) setting that it allows. Again though, there is scope for experimentation and often you may find that putting your aperture down a small amount from the widest setting will give you a sharper image. This is the amount of time that your camera will take to collect light for one image. There is a good rule of thumb for working out the exposure length you should use for astrophotography which is called the 500 rule. Your camera should give you the option of shooting in RAW or JPEG. If you are going to do some post-production (which you will likely need to produce high-quality astrophotography images) you will want to shoot in Raw. Raw images retain more data for you to be able to play around with and adjust afterwards. Whereas if your camera is set to convert images to jpeg then it does some of the post-production for you in the camera and reduces the scope of what you can edit after. This is why jpeg images might look better straight from the camera (and be the most suitable for other, less challenging, photography) but they will limit what you can do afterwards to bring out the full potential of your astro images. Whenever you ask great astrophotographers for their best tips on how to improve, they pretty much all say a version of “just get out there and get practicing”. However, whilst there is definitely truth in that, as a beginner you are pretty much starting with no knowledge, and a little bit of assistance and direction can help a lot in getting better results quicker. Therefore, depending on how you learn best, you might like to read books, take courses, subscribe to websites and mailings, join clubs, or even seek qualifications. There are a number of great books to help you learn how to shoot the night sky. My personal favorite is Astrophotography by Thierry Legault. It can be fairly advanced and mostly focused on deep sky photography but it covers pretty much everything a beginner would need to know in detail. 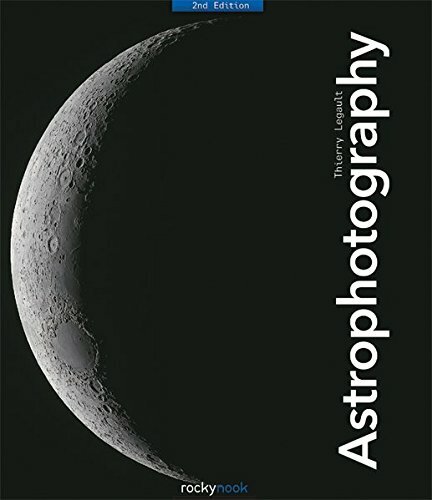 See here for some more recommendations of the best astrophotography books. You may also wish to learn more about astronomy and space in general. In the long run, it’ll definitely help if you want to advance from shooting Milky Way landscapes to deep sky and more advanced astrophotography. 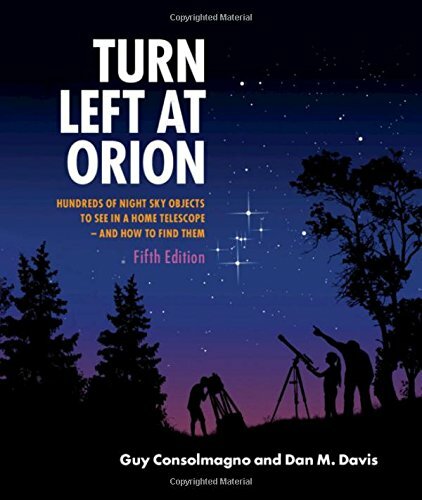 Turn Left at Orion is possibly the most popular astronomy book, covering how to find and spot objects in the sky. See here for further recommended books to help you learn astronomy. Taking courses on astronomy and astrophotography can be a great way to learn. These can be formal courses offered by an academic type institution, workshops led by experienced astrophotographers, or online learning courses based on video or written instructions. There are some great websites out there to help you learn astrophotography, share your images and ask questions to people with more experience than you. These are great because other photographers share their images – landscapes, planetary, deep sky – and give details of what equipment they used and how they went about capturing the image. The community on these forums are generally pretty good at answering questions (no matter how stupid) from beginners, so if you’re struggling to understand something you can also try dropping a comment under a recent post and you should get a response. It’s generally made up of a pretty advanced group of astrophotographers, but that makes it a good place to learn from others. You can see from the description that the exposure too more than 42 hours! Cloudy Nights is a great astronomy forum, with lots of good in-depth articles. It looks a little like an old-school forum but there is a lot of good information to be gleaned from here and there are a lot of advanced contributors. Astronomy Picture of the Day is quite legendary and is quite an honor to have one of your images featured on the site. It’s a pretty simple concept – one feature astronomy image per day, submitted by professional astronomers and members of the public alike – and has been running daily since June 1995. You can submit your own photo to be considered for APOD here. Flickr and 500px are websites where photographers share their images and join groups to learn from other photographers. There are some active Flickr groups on astronomy and astrophotography. Whilst it’s meant primarily as a platform for smartphone photography, plenty of people share great astronomy pictures there. At the time of writing (February 2019), there were nearly 1.7 million images on Instagram with the hashtag #astrophotography and nearly 1.9 million with #astronomy. See here for our list of the best astrophotographers to follow on Instagram. Joining a local club is a good option for a beginner. You can be completely honest about your level and hopefully get some good practical advice on how to advance. If you are in the US, the Astronomical League has a directory of astronomy clubs. Sometimes these groups aren’t always well advertised or easy to find online and so a good bet is to consult local newspapers, notice boards and directories near you. If you are a beginner photographer in general, I strongly recommend undertaking a “365 project”. This is committing to taking and publishing one photo every day. I did this a few years ago and – full disclosure – only lasted three months, but my photography improved vastly in that period. Just the process of going out every day with your camera (or, like me, taking it on your daily commute to work) and looking for interesting things to shoot really help you get to understand your camera. You start to learn about lighting at different times of the day and year, and experimenting with different exposure times, ISO etc. You can toy with landscape, portrait, street and other types of photography. Of course one of the challenges of astrophotography is going out and doing it in the dark, which can be pretty hard to do if you have work the next day, so it’s good to be developing your photography skills without exhausting yourself! What I did was publish every day on a page I had on 500px. I didn’t want to do it on Facebook or Instagram for people that knew me (you may prefer to do otherwise though), but rather do it to the photography “community”. You then learn from the response you get from other photographers and I found that people tend to be very helpful in giving small tips to help you improve. One thing to note, people often start undertaking a 365 project on 1st January as a new year’s resolution, but there is no reason not to start at any time. Just commit to starting on the first day or next month or even just today and set it as your 30/100/whatever day challenge for yourself. As a beginner, Stellarium and PhotoPills are the easiest options for planning your shots, especialy if you are concentrating on landscape or planetary astrophotography. If you are venturing into deep sky photography then you will need more advanced tools like Deep Sky Assistant (DSA). When you are starting out, its best to stick to the popular all-round image processing tools like Lightroom, Photoshop, or even Snapseed on your phone/tablet. If you are looking to get into astrophotography then get going: take your entry-level camera, put the lens as wide as possible, attach it to a tripod, point at the night sky, manually focus on a star, shoot for 15 to 30 seconds, and there you go, you’re an amateur astrophotographer. It might not be great, but you’ll have taken a big step in the right direction. Of course there is loads to learn, but that’s partly what makes it such a rewarding hobby, knowing that the pictures you are producing are the result of time, effort and study. I hope that covers the basics and you have found this guide useful. If you have any questions – or want to note anything else that should go in this guide – then please let me know in the comments below. As astrophotographers like to say – clear skies!